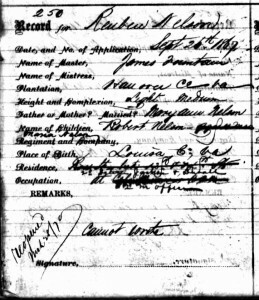 The Society has received a query for any information on a former slave, Ruben Nelson, who, based on a 26 September 1867 application in the Freedman’s Bank Records, was owned by James Fontaine (1799-1872) of Hanover County, Virginia. Reuben was born around 1842 in Louisa County, as was his wife Mary Ann. After the Civil War they lived in Richmond where Ruben worked in a hotel. They had six known children: Robert; Louisa; Ruben W.; James E.; Bertina; and William J. Nelson. 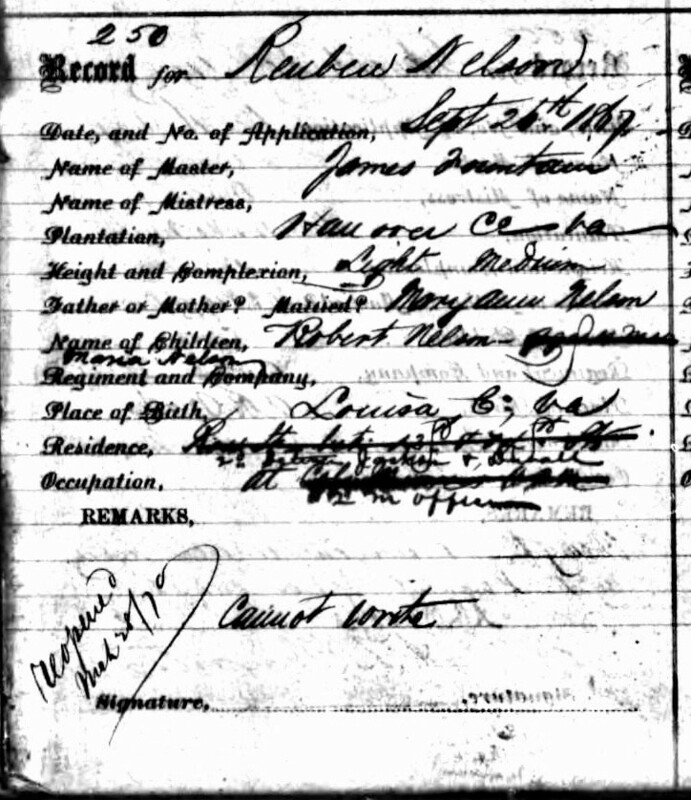 In the 1870 census Ruben is identified as mulatto. James Fontaine had 38 slaves in 1850, one of whom was about the age of Ruben, and 51 slaves in 1860, with two about the age of Ruben, per the census slave schedules generated in those years. In 1860 eight of the 51 were house slaves. James’ wife, Juliet Morris, daughter of Richard Morris, was from Louisa County, where Ruben and his wife Mary Ann were born. Could Reuben have been owned by the Morris family? Richard Morris had 41 slaves in 1850 and 90 in 1860. If you have any information on Ruben or Mary Ann or their family, please contact the Society’s librarian at BHNilsson@aol.com. We are also looking for any photographs of James Fontaine, if any exist. Thank you! The lead article in the Albemarle Charlottesville Historical Society’s 2017 annual magazine focuses on a little known aspect of Matthew Fontaine Maury’s life when he conducted a detailed survey-based physical assessment of Virginia. Based on an idea generated and then commissioned by the Virginia Military Institute (VMI), Maury returned to the United States in 1868 to take up the position of Professor of Meteorology at VMI. His job description included the production of this physical survey, with the thought that such a project would help the state’s rebuilding efforts. Author and researcher Richard Nicholas brings this little-known aspect of Maury’s life into focus in his 29-page article, “Matthew Fontaine Maury and the Physical Survey of Virginia and Albemarle County,” is complete with photographs, including of the full chapter on Albemarle County, citations, and a brief summary of Maury’s Fontaine ancestry and his legacy. The magazine (Volume 75; 2017) is available for purchase from the Albemarle Charlottesville Historical Society’s Store. New Table of Contents for 40+ Years of the Society’s Newsletters! Have you ever wished you had an index or table of contents for all the Society’s newsletters to find an article or information that you remember reading but now cannot find? We have solved that problem by creating a comprehensive Table of Contents for all our newsletters! The Society began issuing newsletters intermittently in 1972 and then on a regular basis beginning in 1984. The Table of Contents is included in the hardcopy and CD versions available from the library and will be kept current. 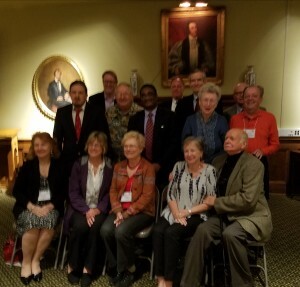 Thanks to Russell Hooper’s effort our annual meeting in Franklin, Tennessee, was a great success with over 70 attendees, many who arrived early to visit the Tennessee State Capital Building in Nashville. 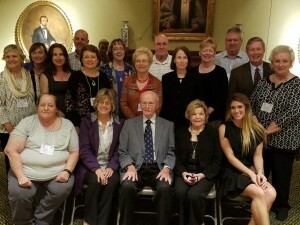 The tour included visits to the Senate and House of Representatives chambers, the Supreme Court Chambers and the Governor’s Reception Room, as well as the State Library. Hall ways and rooms were lit by enormous ornate chandeliers hanging from the ceilings. We viewed busts and portraits of historic Americans such as George Washington, Thomas Jefferson, and three other past United States Presidents, well known literary figures, and early American heroes such as Davy Crockett and Daniel Morgan. There was even a bronze bust of Cherokee Chief Sequoyah who created a written alphabet for native Americans. Numerous ceiling portraits done in 1859 include one of Matthew Fontaine Maury, the Pathfinder of the Seas. We also visited the adjacent Tennessee State Museum where we viewed a bust in storage of Matthew Fontaine Maury. On Saturday we visited the farm where Commander Matthew Fontaine Maury (1806-1873) grew up and a small cemetery where several of his siblings are buried, followed by a visit to the Abram Maury Family Cemetery in a more urban area. Franklin’s founding father, Abram Maury (1766-1825), is buried there, as well as many other Maurys. Matthew Fontaine Maury is buried in Hollywood Cemetery in Richmond, Virginia. 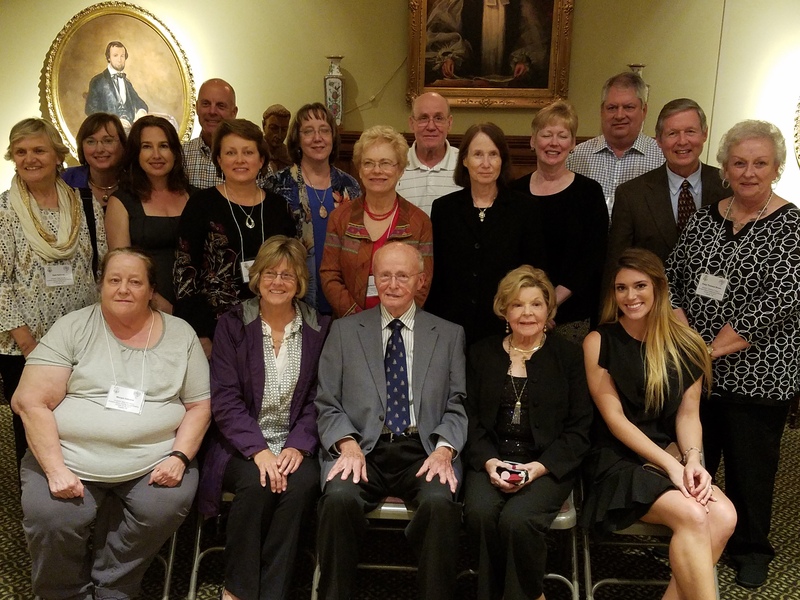 We had lunch at the historic Franklin Masonic Hall where we had presentations by Tina Jones and Rick Warwick about recent Maury research and efforts to document the families of freed slaves. Masonic brothers gave us private tours and explained several masonic traditions. Several of Abram Maury’s sons were prominent Masons. Saturday evening we had dinner and a program at St. Paul’s Cathedral. The Keynote Address on the life of Commander Matthew Fontaine Maury was given by Howard Cohen, Deputy Chief of the Maritime Safety Office of the National Geospatial-Intelligence Agency. 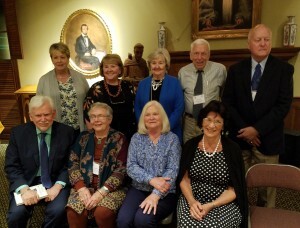 The Fontaine Maury Society meeting for 2017 will be held this year in Franklin, Tennessee, on October 20-22. The meeting will focus on Franklin’s founder, Abram Maury (1766-1825), grandson of Mary Anne Fontaine and Matthew Maury, and Abram’s young cousin, Commander Matthew Fontaine Maury (1806-1873). Commander Matthew Fontaine Maury, the grandson of Reverend James Maury (1717-1769), was born in Virginia in 1806, but moved to Franklin with his branch of the family in 1811 to join up with cousin Abram Maury who founded Franklin in 1799. Coincidentally, October 20 is the 301st Wedding Anniversary of Matthew Maury and his wife Mary Anne Fontaine, October 20, 1716. We have already reserved a block of room for us in the Holiday Inn Franklin-Cool Springs at a rate of $109 per room. It is located at 1738 Carothers Parkway, Brentwood, Tennessee 37027, 615-277-8700. Please be sure to tell them that you are with the Fontaine Maury Society to get the group rate. Unfortunately John Grady, author of Matthew Fontaine Maury, Father of Oceanography, A Biography 1806-1873 (published in 2015 in Jefferson, N.C., by McFarland & Co., Inc., and available from Amazon.com) and former longtime Editor of the Navy Times, is no longer able to attend to speak about his comprehensive biography about the Commander but rest assured that we will have a keynote speaker who will enthrall us with details of the local family. The historic Franklin Masonic Hall, the oldest public building in Franklin (1823) and one of only three Masonic Halls in the Nation listed as National Historic Landmarks, will serve as a base of operations throughout the weekend. Several Fontaine-Maurys were members of the Hall and we can view their names in the original ledger. Society member and organizer of our weekend, Russell Hooper, will also try to display some of his private collection of Fontaine-Maury papers, the largest such collection in private hands, at the Hall. We are including an optional visit to the Tennessee State Museum in downtown Nashville to view Commander Maury’s bust. The museum is a 20 minute trip from Franklin. Another point of interest for us is the State Capitol in Nashville where a portrait of Maury is painted on the ceiling. We will be also visiting the Abram Maury Cemetery in Franklin where Abram Maury and other prominent Tennessee Fontaine-Maurys are buried. St. Paul’s Episcopal Church in Franklin, the Mother Church of the Diocese of Tennessee, is planning to host a cocktail event for the Society the evening of the 21st in Otey Hall. Commander Matthew Maury’s lifelong friend and teacher at the Harpath Academy in Franklin in the early 1800s, Bishop James H. Otey, founded St. Paul’s and established the Episcopal Diocese in Tennessee. An option for Sunday for those who might have time would be a visit to Maury County, twenty minutes to the south where several prominent Maurys are buried at St. John’s Episcopal Church. Commander Maury’s mentor, Bishop James H. Otey, is also buried at St. John’s. Maury County was named in honor of Abram Maury in 1807. Please complete the registration form below and mail it to the address provided! With Verizon turning off its email service, the email address for our librarian is now BHNilsson [followed by the “at” symbol].com We are updating it on the Society’s webpage. The Society has received a query from a gentleman writing an article about Matthew Fontaine Maury and the Maurys of Charlottesville who is looking for a narrative written by Stephen Price Maury (1850-1941) of his life there, last told it was in the possession of his granddaughter Judith Maury Gravely. Does anyone know where the manuscript is now or have a copy of it? Please contact the Society’s librarian ( FontaineMauryLibrary at verizon.net ) with any information.